Do we need to see Psycho 2 to appreciate this? ^It takes place one month after the events of part 2, so it's definitely recommended. Psycho IV is really the only one you can jump right into being it's a prequel. This is my favorite series in horror by far. I would definitely recommend Psycho II, which is probably my favorite of them all. Thanks guys, I will try to track it down! Definitely see Psycho II first if you can; otherwise this sequel ruins the ending of a strong predecessor. Psycho III was pleasantly surprising and worked well in displaying Normans conflicted personality (driven to kill, but also not wanting to). The final ending bit was a little bit of a let down because to me it suggested he was more a killer than the rest of the movie suggested. I really like the parallels with the Maureen character to the first movie, but felt like she just got brushed aside too readily - but it was cool to see a spiritual successor to one of our first victims now revered (in the middle of a Homecoming celebration at that). Also the Dwayne character was a nice contrast being a sleazy thrill seeking opportunist to Norman's subdued but murderous personality. There were some strong plot themes. The subset pick is Psycho III, right? The YouTube link in the first post leads to Psycho IV. It's Psycho III for the subset. Didn't try that link, but I think III is on YouTube in parts. Yep link takes you to Psycho IV, but Youtube has part III in 7 parts. I don't need it since I have all the Psycho films in my collection . Yeah, I found Psycho III there as well. Just wanted to double check and make others aware as well. I didn't want some of our more brain fried horror marathoners watching the wrong movie. Perkins does a great job portraying Norman's wide range of mental instability. I also think he did a good job of directing the film as well. I really liked how he occasionally used a little misdirection, bridging scenes in different locations together by making you think you were looking at things in one location when you had really just jump cut to another. The bloody ice cube scene is still as creepy now as it was almost 30 years ago. 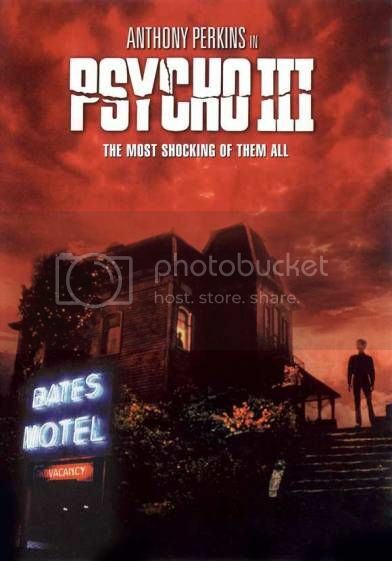 I actually read the novel for Psycho II before seeing the movie back when the movie was first released. It is a COMPLETELY different story so I was a little disappointed when seeing the movie, but it is a good story too. I agree with your view of the bloody ice cube scene for sure, but can you elaborate on your comments about the misdirection? I'm no sure I can think of a scene that you describe. I've heard about that Psycho II novel just in the past few years. Something a film production? Would love to track down a copy. I must have owned it at the time but I don't have it now. I can't remember the plot at all anymore. Another novel I'd love to track down is the novelization of Ridley Scott's Alien. I remember it being quite good. Can't find it anywhere anymore. Is that the one by Alan Dean Foster? I'm having an impossible time finding all the Friday the 13th novels - many by Simon Hawke - for less than ludicrous prices. Yes, that rings a bell. Thank you! That helped immensely! Now I've found it! Strangely enough, amazon.ca shows it being rereleased in March 2014. Last edited by pacaway; 10-28-13 at 06:38 PM. Well, I watched Psycho first (a movie that i would give 6 stars on a 5 star scale) and then got to unwrap my nice new BDs of II and III. Watched II and III back to back and forget how quickly they followed each other. Both are very difference beasts in my opinion and really house to very different Normans. But both are quite enjoyable. Watching them back to back after not seeing them for so many years, I have to give the slight edge to III over II just because I enjoy my Norman completely off his rocker. The last scene with Norman grinning manically in the "Mother" costume is chilling. While it could have been seen as possibly humorous, I felt it was anything but. I luckily own Psycho IV and remember enjoying it as well, so I look forward to revisiting it very soon. My rating for III: **** out of *****. I noticed that you can buy a DVD-R of the original TV pilot of Bates Motel (from 1987 - not related to the new series) from Amazon. They just released that at the beginning of this month. Anyone here ever watched it? Also, I have yet to watch the new Bates Motel series. Any thoughts on it as well? By the way, I recently watched Hitchcock which dealt with the making of Psycho. I really enjoyed it and highly recommend checking it out if you are a Psycho fan. Don't know how much truth there was to all of it but I found it very interesting. Happy to help, hope it's good... I suppose it's the 35th anniversary next year, but a re-release seems intriguingly odd. Intriguing.. so is that now everything Psycho officially released..? How many different companies are involved - is there any chance of a dozen-disc collection with all of the differing versions in it, I wonder..? Psycho is a classic, and I never thought the sequels would be worth a damn. I was pleasantly surprised that they were both pretty good. I liked that they explored new areas and weren't just retreads of the first film. Psycho 2 especially had some great plot twists that caught me off guard. This is an example of a subset pick that got me to watch a movie I probably never would have considered. Great to hear DaveyJoe. I first caught Psycho II when I was thirteen and it aired on cable. So I actually saw it before the original. I'm a fan of the entire series, and I even think Psycho IV: The Beginning is worth a look. Perkins is back in that, but the focus is on the young Norman in flashback, played effectively by Henry Thomas. Anyway, glad you like these. I haven't seen Bates Motel in years. Perkins hated it because it was out of continuity with the films. I remember being underwhelmed by it, but I wouldn't mind seeing it again. The new Bates Motel is an interesting spin on the entire concept. I really liked what I've seen, but I still have to finish the first season. It's well made and acted, that much I can tell you. I watched Psycho IV: The Beginning the other night and feel that it is very underrated. I thought Henry Thomas does a good job as a young Norman. Anthony Perkins is excellent as always. Might have to get that Bates Motel DVD-R just to satisy my curiosity.